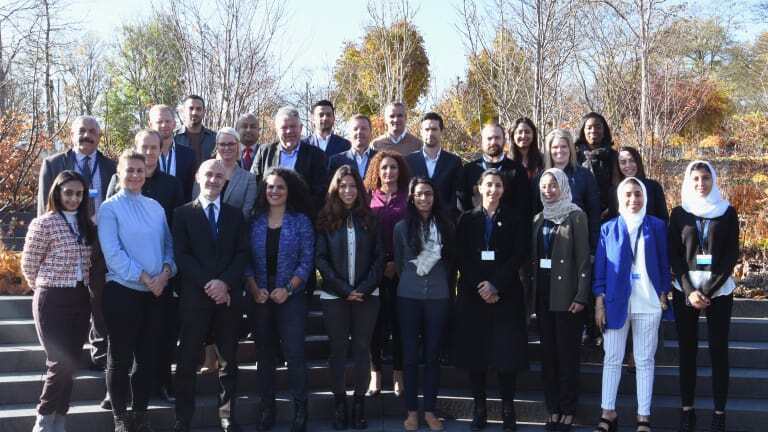 In Zurich, the recently-formed FIFA Foundation brought together Member Association representatives from the Middle East and Nordic regions to engage in a workshop to discuss and share knowledge on the topic of ‘Football for Girls in the Middle East’. Established in March 2018, the FIFA Foundation acts as an independent entity with the objective to help promote positive social change around the world through football. Citing the United Nation’s 17 Development Goals as a base model, the Foundation has identified five relevant areas to focus on, namely: community building, health, education, equality & inclusion and dialogue & peace. The two-day workshop at the Home of FIFA allows for the Foundation to foster relationships between Member Associations and FIFA, but more significantly between the Member Associations themselves. Kjetil Siem, Director of the FIFA President’s Office and Acting Secretary General of the FIFA Foundation, kicked off proceedings by outlining the fundamental aim of the gathering: to empower more girls to play football in the Middle East region. “A lot of the girls in the room have been playing football in the region, so we’re going to hear some of their stories and see what kind of challenges we need to fight - what is the most important thing that we as FIFA and the FIFA Foundation can assist with,” Siem said. Regarded as pioneers in the development of women’s football, the Nordics have been identified as an ideal counterpart for the Middle East to learn from, a co-operation which the Foundation hopes will contribute to better equality and inclusion practices, by educating, empowering and communicating with girls through football. With representatives from Bahrain, Iraq, Jordan, Kuwait, Oman and Saudi Arabia - as well as Denmark, Faroe Islands, Finland, Norway and Sweden - the open and honest discussions focussed on fostering strong relationships. “Finally we’re getting to be part of the ‘official football world,’ where as we never were before,” explained Women’s Football Committee member from Kuwait, Ayeshah Al-Khaldi. “It’s exciting that we are all here and talking to each other and really it’s about having the passion to continue. That’s our biggest challenge,” she said. The workshop is considered to be just the first step in what will ultimately be an eight-year collaborative project for these two regions. Siem outlined in closing that they would now consider drafting a Memorandum of Understanding to be signed by the FIFA Foundation and the two regions themselves. The FIFA Foundation will draw upon an existing project model setup between the Norwegian FA and a handful of Middle Eastern countries, with the difference being the Foundation will tailor their programme to the specific needs of each involved Middle Eastern Member Association, determining that a one-fits-all model would not work.